The seasons are beginning to change, the leaves beginning to brown, and colds are on a steadily increasing rise. Here are a few of the best tips for preventing one before it begins. We know it’s easy to forget about sleeping in the midst of stress, especially as the end of year deadlines come around. But, it’s important to remember to prioritize personal health, especially when you feel a cold coming on. When you’re tired, your body doesn’t fight infections as well, making them infinitely harder to combat. Need an excuse to push yourself on that impossible diet? Use this - your body fights infections better when it has a well-built immune system. Eating healthier foods, from fruits to proteins, helps your body fight infections before they become an issue. It’s easy to remember to sanitize your hands, but it’s far more difficult to remember to clean the spaces around you. Desks, computer keyboards and purses are hotspots for germs but don’t forget about smaller spaces, from doorknobs to sink handles. We’re all far too familiar with the common tip for washing your hands, but it’s significantly more difficult to remember to actually wash them well. Using soap and water is one thing, but studies have proven singing 30-second songs, like “Happy Birthday”, can drastically decrease your chances of catching the flu. Duh. This one’s easy, simple, and yes, we admit relatively annoying but necessary. Don’t skimp out on this step. 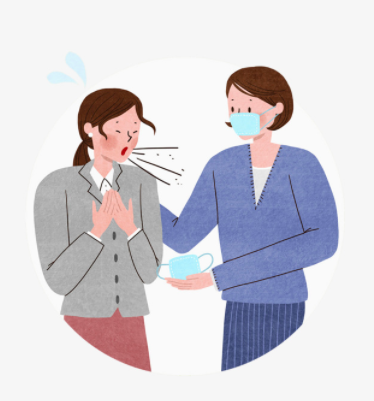 The number one way flu is transmitted is through person-to-person contact. If you notice someone coughing or sneezing, holding your breath for so much as 6 to 10 feet could save you weeks of annoyance. Combine a tablespoon of water with a cup of warm water and gargle for around a minute. The rinse flushes out bacteria and germs, helping you to prevent a cold before it happens, and get rid of a scratchy throat at the same time.